It seems that we don't really appreciate genius until he is gone. I am referring to Prince, the artist. Prince wrote the soundtrack of my life. People often can't get past his sexual lyrics and have written him off over the years as well...crazy! He had a theory that people that had issues with his lyrics, had issues with sexuality overall. Aren't most geniuses crazy? In my mind, he just said it like it was. He sang about things that were taboo. He said things that were shocking. He wore things that were shocking (Any die-hard Prince fans remember those bikini underwear, trench coat and leg warmer days!!). If you let yourself giggle over his "get-up," open your ears and get past the look, you would realize he is amazing. His 1980 concert at the "Bottom Line" in New York City broke all barriers. His vocal range was tremendous, his guitar riffs out of this world, and his dance moves in four inch heels were killer. He wrote, arranged and played ALL of the instruments on his first album "For You." He was an 18 year old kid that refused to let anyone tell him how to do anything when it came to his sound. He could have had the producer of "Earth Wind and Fire" but he refused to work with him. He had his own sound...For a while. He would get a hit then move on. He would get tired of that sound and create a new one. And a new one after that, and new one after that. To me,most music today all sounds the same. Between the sampling, the outright copying of other artist's sound, and lyrics, and the auto-tuning of people who cannot sing, (I.E-Paris Hilton, Britney Spears) It's no wonder Prince had a 40 year career! I was 12 when I first heard "Wanna Be Your Lover." I thought it was a girl singing. I would dance around in my room to it. His image was quite risqué back then. He either wore very tight pants and his shirt unbuttoned to his navel or skin tight leopard jump suits with bell bottoms. His image did not become well known until he came out with "1999." He pushed the boundaries between male and female with an androgynous look. A man with make up on, all of a sudden everyone was talking about Prince. Teenage girls were wearing frilly blouses and purple army jackets. People were talking non-stop about his look. A lot of people questioned his sexuality, trying to determine if he was gay or straight. 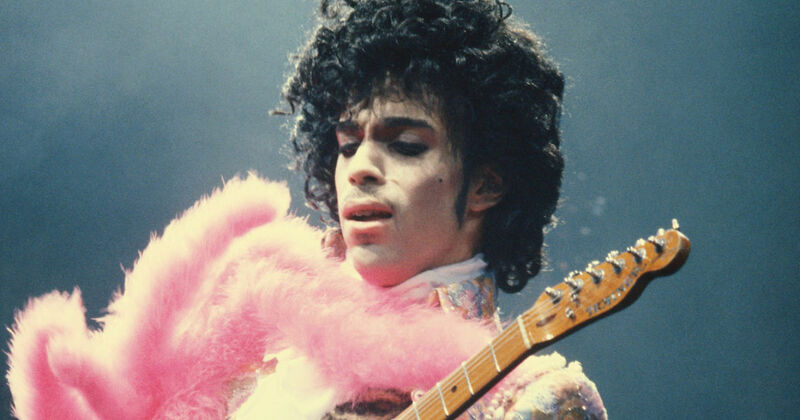 But for Prince, it was all about the music. It was all I cared about too! I could care less if showed up in a video wearing a dress! I played "1999" over and over until my cassette tape broke and had to run out that day and buy a new one. I was obsessed! Then one year later, "Purple Rain" came out and it turned my world upside down. The guitar riffs, the screaming, the completely unknown new sound that he invented that set my car speakers on fire. I played it over and over everywhere I went. I worked in the books and records department at Caldor at the time and my coworkers would call me up and yell "Do you have to play 'Purple Rain' again?" My answer was "yes! yes I have to! ".